The talons of a bald eagle are powerful tools as well as weapons. Eagles use them to perch, climb, capture prey, tear flesh, as well as for battle with other birds. Eagles hunt and kill with their feet, so their talons are a big factor in their ability to eat and survive. The talon is a sharp, hooked claw. Bald eagles have four on each foot: three in front and one hallux talon in the back. The hallux talon is longer than the others. An eagle’s grip strength comes from muscles and tendons in their legs. The sheaths of the tendons are ridged creating a ratchet which locks the talons when an eagle grips. This helps the bird keep their feet closed for extended periods of time while flying. It is estimated that an eagle’s grip is ten times stronger than a human adult’s. With pressure of approximately 400 psi (per square inch), the eagle is powerful enough to pull a fish out of the water or lift small prey off the ground. On August 12, 2018, a seagull was seen with fishing line wrapped on its wings and tail near Juneau’s Salmon Creek. The bird also had a bobber hanging from its mouth. A Good Samaritan (on his exercise run) found the bird who was unable to fly or walk because of the fish line. Two people working in the area took the bird from the Good Samaritan and paged the Juneau Raptor Center (JRC). A JRC volunteer responded and the bird was taken to JRC’s clinic where fishing line was removed from bird’s body. Unfortunately, a treble hook with fish line was attached and lodged in bird’s throat. 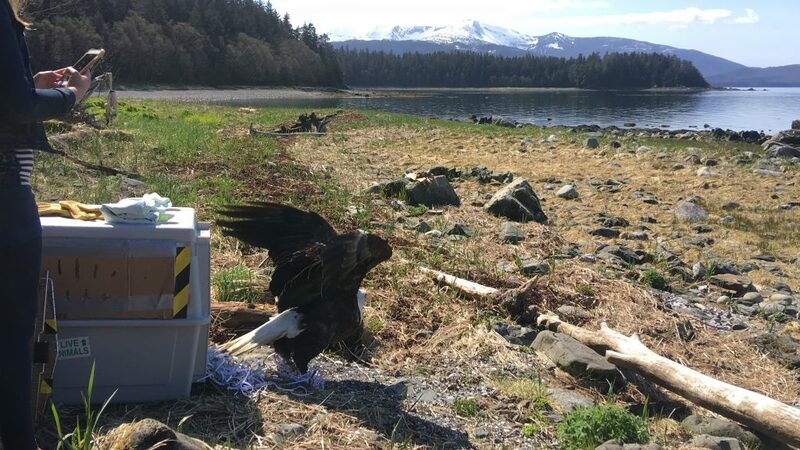 Bird was transported the next day to the Alaska Raptor Rehabilitation Center in Sitka for further evaluation courtesy of Alaska Seaplanes. Sadly, their veterinarian determined euthanasia was the best solution because more damage would have been caused by attempting to remove the treble hook. We cannot stress enough that leaving fishing line, lures with hooks, etc. lying around is very harmful. This debris is not only a danger to birds but to all wildlife and domestic pets. But because of someone’s carelessness, this otherwise healthy bird had to be euthanized. 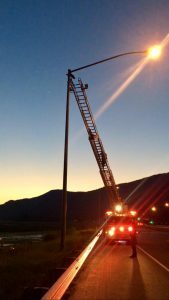 Around 9:45pm on August 6, 2017, the on-duty pager person for the Juneau Raptor Center (JRC) responded to many calls about a raven or crow spotted hanging near the top of a light pole on Juneau’s Egan Drive. When JRC arrived onsite, they were pleasantly surprised to see that Capital City Fire and Rescue (CCFR) had also been contacted and was onsite. 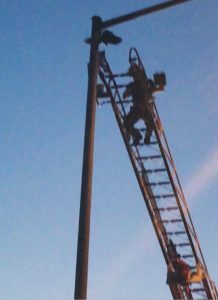 CCFR was just departing the scene after successfully rescuing the bird: a crow. JRC followed up and went to the station. These great rescuers had already removed the fishing line that had entangled the bird by the time JRC arrived. After pickup, the bird was given a cursory exam, food and water and allowed to rest overnight. The next morning, a more detailed exam revealed the foot that was entangled was grasping fairly strongly – a good sign of not too much damage. He did have a small wound on the top of his foot, near the ankle. Because the bird was spotted and promptly reported, this undoubtedly contributed to minimal injury. The bird quickly graduated to a large mew to ensure that he could fly and eat. On August 10, he was taken back close to where he was rescued and successfully released back to the wild. We and the crow are very grateful to all the people that called about this bird and to CCFR for taking the time to rescue him. Late one evening in July 2017, a young man and woman were driving on Juneau’s Thane Rd. They noticed something that looked like a bird in the middle of the road. They stopped to investigate and found it was a raptor. They picked it up and called the Juneau Raptor Center’s pager to report it. The bird was brought to a member’s house and put in a kennel. The next morning it was examined, treated and identified as a merlin (falco columborius). 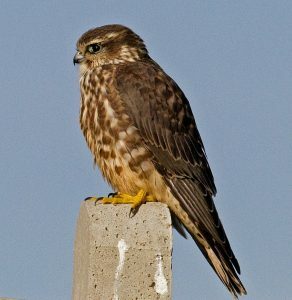 A merlin is a genus of falcon. It was very passive which is unusual for this species of bird. However, by the afternoon it became more active so it was given a small amount of food. It was then moved to an outdoor enclosure to make sure it could fly, which it did immediately. After another day of being in the enclosure and eating, it was determined that it could be released. The merlin was taken to a place on Thane Rd. close to where it was first seen and released. It flew strong and fast into the closest trees and disappeared among the branches. They use surprise attacks to bring down small songbirds and shorebirds. Sometimes they will hunt in pairs. One bird flushes the flock from below. The second bird takes advantage of the confusion to attack. This tactic for the merlins is generally very successful. You can usually tell them from larger falcons by their rapid wing beats and overall dark tones. Medieval falconers called them “lady hawks” because noblewomen used them to hunt Skylarks. Merlins don’t build their own nests. They take over abandoned nests of other raptors or crows. Merlin populations have improved since the ban on DDT was enforced. Check it out!!! The Juneau Raptor Center’s Dale Cotton with Gyrfalcon Phil and Jaimie Rountree with Justice the Adult Bald Eagle, teamed up with PBS and the Wild Kratt Brothers on Thursday, July 20th, 2017. New species of bald eagle? On May 12, 2017 at 5:56 pm, the Juneau Raptor Center (JRC) received a call about a juvenile bald eagle standing on the side of the road at mile 31 with missing head feathers. 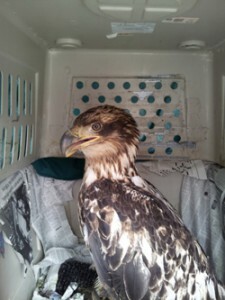 The caller agreed to keep an eye on the injured eagle until a JRC volunteer could arrive on scene. 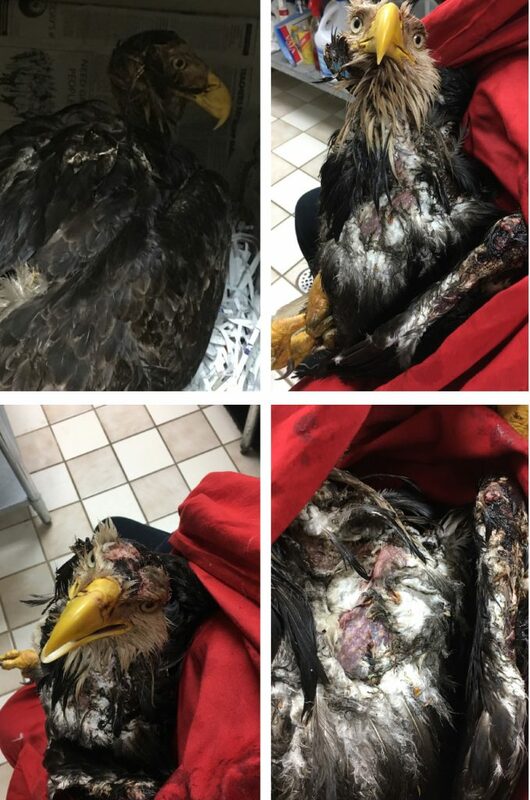 When the volunteer arrived, the bald eagle was hardly recognizable. It was perched on a rock near a waterfall. Upon approach the eagle tried to fly, but could only hop away. Unfortunately, it moved in the direction of the waterfall. The eagle was so weak it was knocked down by the waterfall, getting completely wet. The injured eagle was quickly captured with a net, taken out of the water and brought to the road. During a quick exam and removal from the net, it was a surprise to realize that this eagle was NOT a juvenile like reported earlier, but a male adult Bald Eagle! This bird had completely lost all feathers from the back of his head to the end of his neck and was covered in old blood, wood and pine debris. The feathers were rubbed off on his chest, red skid marks and bruising on the back along the spine, and the left wing had major wounds to the wrist, with old blood and bone visible. It appeared that he was struck by a vehicle and dragged for a distance. Although there were no witnesses that stepped forward, with all birds it is helpful to immediately notify JRC (pager number below). Other agencies that can also be contacted are the U.S. Fish & Wildlife Service at (907) 586-7484, State Wildlife Troopers at (907) 465-4000, State of Alaska Department of Fish & Game at (907) 465-4100 or the Juneau Police Department (907-586-0600) when an injury occurs to a raptor (Eagles, Hawks, Falcons, Owls) or other bird by a vehicular collision. This tough guy is amazing, still standing with such a will to live despite his wounds! He was quickly taken back to JRC clinic and given treatment with fluids, antibiotics and pain medication. He dried off quickly inside the large dog kennel and rested in a warm, quiet and safe environment. We also noticed that this male eagle has a brood patch on his belly, indicating that he has a mate and nest with possible young and/or incubating eggs. It is our hope that he will pull through and be released in the near future to be reunited with his mate. Because no one called in the accident, this eagle’s chances of survival are lower than if we had been notified sooner. The old blood and the fact that he is very thin are indicators that he has had these injuries for a while. 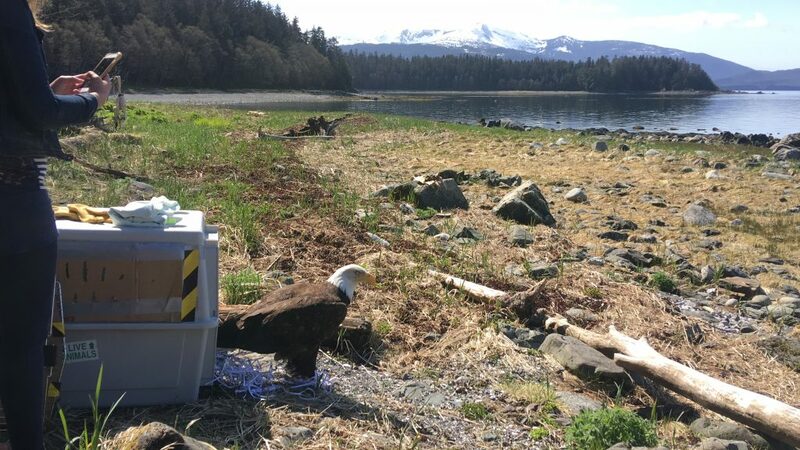 On May 13, he was transferred to the Alaska Raptor Rehabilitation Center in Sitka for further evaluation. 5/16/2017 update: That poor bird. He is doing okay. Had a little issue with his temp dropping, but he seems to have worked that out. Funny that you described him as a vulture…we named him Turkey…as in vulture! He is hanging in there, but we have a long way to go. It is going to be a while before we can put him out…there will be some issues with staying warm…since he is missing so many feathers! For now he is doing okay. September 2017 update from the Sitka Alaska Raptor Center: Turkey‘s feathers have mostly grown back, except for a small patch on his head and he once again looks like a Bald Eagle! He is flying beautifully and will be evaluated for release in the coming weeks! Please make it a priority to call the JRC pager right away at 907-790-5424 if you see an injured bird. In addition to the other numbers shown, if you live out of Juneau, you can also contact your local police department or animal shelter. Thank you for looking out for our feathered friends big and small. “Like” us on Facebook for updates on new patients. In case you didn’t already know, JRC helps all wild birds from hummingbirds to eagles. May 8th 2017 , at 1:05pm , Juneau Raptor Center (JRC) received a call about a crow hanging by its right wing from Fishing line about 15 ft up in an alder tree , near Juneau Empire building. Juneau Raptor Center volunteer, Alexia Kiefer arrived to the scene and acted quickly, by climbing up the tree with a net and knife in hand to free the crow. This was not an easy task, but with determination and thoughtful planning the crow was finally freed and carefully carried down the tree . The crow was taken to our clinic where he got a full exam , volunteers found more hidden nylon fishing line wrapped tightly around the right wing under his covert feathers. After exam no further injuries where found. Luckily the crow only suffered a right sore wing . The next day the crow’s right wing was checked and to our surprise he had full use of his wing again . It was determined that the crow was ready to be release considering he had a mate waiting by him during the rescue ( indicated there might be a nest with young) . May 9th ,2017 the crow was taken back to same spot rescued and released. The crow flew out of the dog kennel and landed on the nearest tree , he called out immediately, about 5 mins later the crow was join by another crow . Now That’s a Happy Ending! 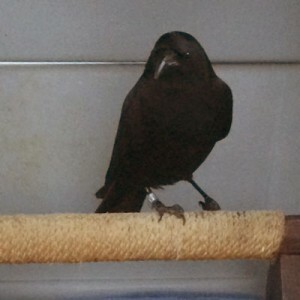 Thank you to the caller for taking time out to help this crow ! Unconscious adult bald eagle recovers! On May 2, 2017, JRC volunteers responded to a page about an unconscious adult bald eagle on Juneau’s North Douglas Rainforest Trail. The bird was immediately taken to JRC’s clinic, administered subcutaneous fluids and antibiotics. Thankfully there was no evidence of broken bones. She was also administered charcoal because she exhibited symptoms of possible poisoning. We find that sometimes beloved pets, after they have been euthanized, are buried in the forest. Unfortunately, they are often uncovered by wildlife with the resulting ingestion of toxins. If this is done, it’s very important that the animal is first properly wrapped prior to burial. Cremation is best. Exam revealed a very large bird weighing around 15 pounds. She was not thin. Further exam revealed a brood patch indicating she had laid eggs or was brooding them before she was injured. The hiker who found her thoughtfully marked the direction of the bird in the dirt with sticks and arrows; a huge help to us in quickly locating her. He first called U.S. Fish and Wildlife Service who in turn paged us. Our pager number is (907) 790-5424 (answered 24/7). On the third day of care, she regained consciousness and was standing. She was such a strong bird! After going to Sitka to test her flight abilities and passing that test perfectly, she was returned to Juneau. On May 6, she was returned to the site where she was found, released from her kennel and quickly flew off! When her kennel door was open she quickly came out within seconds and flew a complete circle and landed on a nearby tree. She gave out a long desperate call that I have not heard a bald eagle do before. She was clearly trying to locate her mate. She sat there for 20 minutes waiting for a response. I think at that time she realized where she was and she took flight again and this time with purpose toward the mountains of Douglas Island. We’re optimistic that she was away from her possible nest for such a short time she will reunite with her mate. When one parent does not immediately return, it’s reported that the other parent will stay on the nest for up to a week. Our fingers are crossed. 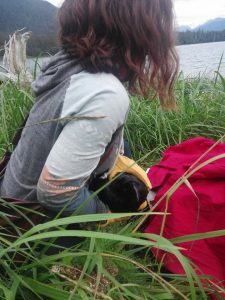 Thanks to the hiker that found this bird and got her help as soon as possible! 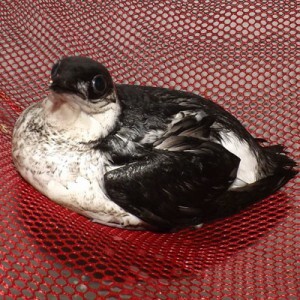 Because of the caring people in Southeast Alaska helping birds, we were able to save a life. Thank you! On August 20 2016, Juneau Raptor Center (JRC) received a page about a bird stuck down a narrow 4 foot shaft on the side of Juneau’s Flume trail. The unlikely hero who found this Juvenile Swainson’s Thrush (Catharus ustulatus) was an 8-year-old Golden Retriever named Nikita. 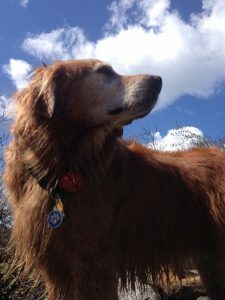 Nikita and her owner Debbie McBride were out on a hike trying to help a friend find their lost dog. At the beginning of this day’s walk, Debbie’s dog showed special repeated interest in one of the shafts along the trail. Debbie looked down the shaft, only saw a tennis ball and got Nikita moving again. At the end of the hike Nikita went back to the spot and would not come after being called several times. Debbie decided to investigate the shaft one more time. At that point she saw and heard the calls of a distressed bird stuck in the wet dark hole. JRC volunteer Alexia Kiefer arrived shortly on site and quickly duct taped a small green tank fishing net to a long pole. She then carefully scooped up the wet and weak juvenile bird that she gently wrapped in a loose blue pillow case (like a nest) and put him in a small kennel. The juvenile thrush was taken to Alexia’s house and put into a larger kennel that was partly heated by a pad as well as a heated room. Initial examination revealed no significant injuries, however the bird was all feathers and bones: he was severely malnourished. If it weren’t for Nikita’s nose and determination to not leave the bird (despite being called by her owner), the bird likely would have died of starvation. This juvenile Swainson’s Thrush has a strong will to live and started eating raspberries an hour after being warmed up. On the second day the bird started hopping up and down perching on the branches in the kennel and eating mealworms. On the third day it was decided that the bird should be placed in a large enclosure (mew) with a heater at another’s volunteer’s home to help strengthen its wings and fatten him up for before being released to join the migration south! August 26, 2016 update: On this date, the mew door was opened and the bird flew out and landed in the nearest tree. After that, it flew away. I love these kinds of stories. Thank you Nikita and Debbie for helping our feathered friends! Juvenile raven back to the wild! Shared by Alexia Kiefer, volunteer at Juneau Raptor Center. 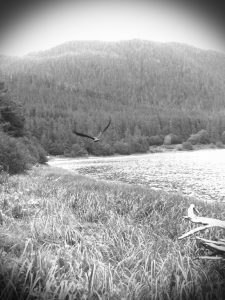 On Friday morning August 12, 2016, the Juneau Raptor Center (JRC) received a page about a juvenile Raven at Juneau’s Auke Bay Point Louisa popular beach/trail area. The bird was wrapped in fishing line and hanging from a 20-foot tree by its wing. 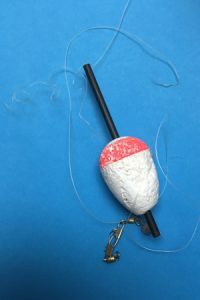 The caller was able to recruit some fishermen who tied a knife to their fishing poles and were able to cut the fishing line that kept the raven hanging in the tree. They were able to see that the raven could not fly once it was freed. Two JRC volunteers soon arrived on site. The juvenile Raven was found resting on a stump and the bird was easily captured with a net. The Raven was transported to JRC’s clinic. Examination revealed more fishing line tightly wrapped around the bird’s wing. The fishing line was difficult to remove but fortunately there were no serious injuries – just a very sore wing! With 10 days of R & R spent in a large outdoor mew (enclosure) at another JRC volunteer’ s house, the raven was able to spread its wings, fly around to help strengthen the sore wing and given food to aid in its recovery. This juvenile Raven was not a picky eater, ate whatever the volunteers feed him and loved destroying all the toys it was given. The juvenile Raven was ready to be released in the same location it was found the afternoon of August 22 ,2016. Many thanks again to Teresa and the two fishermen that assisted in this rescue. We love happy endings! It seems every tour season, we receive at least one or two birds that have decided to join the thousands of cruisers heading to Southeast. This year was no different. 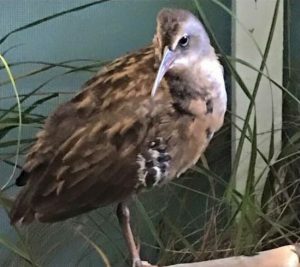 On August 6, 2016, an onboard naturalist from one of the cruise ships handed over a juvenile Virginia Rail to JRC. This little one had been found onboard three days prior after leaving BC. It is thought that most of these stowaway cases are migrating birds that get confused by the lights on the cruise ships and then end up off course. This can be a common problem in larger cities with light noise also. After three days on the boat with no food, the little Rail seemed eager to be offered good food and water options. 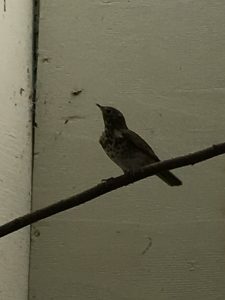 The little bird was eating and drinking within an hour of arrival in Juneau and in a more appropriate enclosure. JRC volunteer, Alexia put in amazing effort to build an appropriate habitat as well as attain natural food for this little one. Much of the food was actually caught from Mendenhall wetlands, not purchased. This is another perfect example of the commitment of our volunteers. The bird had no injuries and had just gotten off course and weak from its days without food and water, onboard the cruise ship. In addition to a custom habitat and wild caught food, Alexia also invested the time to play Virginia rail recordings and install a mirror to ease the lack of companionship for the little rail. 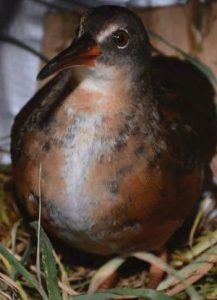 After a few weeks, the transfer was set and the Virginia Rail was ready to venture back south. The Rail was shipped to a rehabilitation center in Washington where the bird was immediately released. Another success for JRC! The forehead feathers of the Virginia Rail are adapted to withstand wear from pushing through dense marsh vegetation. The Virginia Rail can swim under water, propelling itself with its wings. It swims in this way probably only to flee predators. The Virginia Rail and other Rail species have the highest ratio of leg muscles to flight muscles of any birds. The Virginia Rail builds numerous “dummy nests” in addition to the one where eggs are actually laid. On August 21, 2015, a surprised Douglas Island resident (near Juneau) discovered a Great Blue Heron in her carport. The bird was hunkered down in a feathery ball. When approached cautiously, he stood upright and spread his great wings; then unsteadily made his way around the building and onto the beach where he again huddled. Another heron flew in and landed alongside for a time but then flew away. 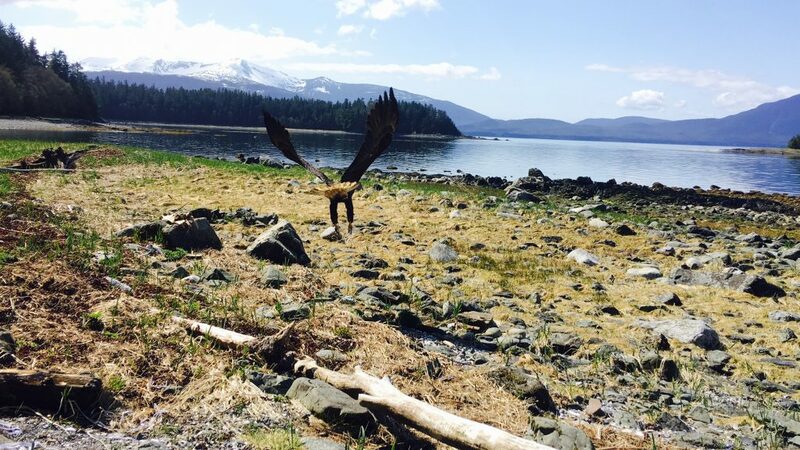 After a call to the Juneau Raptor Center (JRC), a volunteer arrived and attempted to capture the heron who, though unable to fly, was able to avoid his captor on the slippery beach. The next day though, he was successfully caught and transported to the JRC clinic. He was initially kept in a large kennel for observation and later examined for injury. On examination, he was found to be thin but no bones were broken and there were no obvious injuries. Nothing explained his inability to fly. He was force-fed small jack salmon but as is common with stressed herons he nearly always regurgitated his food. Being a large bird, he needed more space in order to reduce his stress and allow him to begin his recovery. On August 25th, he was transferred to another volunteer’s large enclosure that would provide him room to exercise and hopefully regain his strength. Upon release in the mew, he stumbled a bit and unsteadily bumped into a wall. He appeared to have balance issues perhaps from a head injury or an ingested toxin. Since herons usually catch and eat live food, his caretaker provided 11 feeder goldfish in a large tub of water. A few hours later 6 had been either tossed aside or eaten and by the end of the day all were gone. The bird was standing and walking but showed no inclination to perch. Small thawed jack salmon were then offered in the water tub, but were ignored so more goldfish were purchased. This time only 3 goldfish were offered along with 4 thawed smelt and the water was set to swirling to encourage Bleu to eat. Very soon all food was eaten. This was repeated twice a day, gradually increasing the number of fish offered until, after several days, the heron was eating smelt and small jack salmon readily and had begun to perch on a log. He continued to make slow but steady progress and began using a higher perch and then flying just a few feet at a time. On September 11th he was moved to a larger enclosure where he could use a number of perches and fly from one to another. Gradually after some awkward first attempts, he was able to fly from perch to perch eventually landing gracefully. On September 21st he was transported back to the beach where he was rescued. It was low tide, a favorite time of day for the herons to hunt for food. After being released, he immediately flew far out toward the waters of Gastineau Channel, rested awhile and then flew to the edge of a creek where he alertly watched the water. No doubt he soon caught a meal. The reason for his illness was never determined but, given time, he was able to heal himself. On November 24, 2014, two generous locals stopped on the road near Juneau’s Costco to pick up a crow in distress. Bato made no attempt to fly away, seemed to have an injured leg, and was placed in a small kennel until someone from the Juneau Raptor Center (JRC) could pick him up later that day. There were no fresh wounds and he was very hungry, so Bato had probably been on the ground for some time. A JRC volunteer examined him that evening and discovered a bruised left elbow and feathers matted in dry blood over his limp left leg, but no broken bones. Puzzled by the non-functional leg, an x-ray later revealed that Bato had been shot with a pellet gun; the pellet, lodged in the knee, was removed and the wound cleaned, but it had damaged the nerves beyond repair. Thankfully, crows and other corvids routinely survive in the wild with one leg. Bato received antibiotics and anti-inflammatories for two weeks while he recovered. After several days in a large dog kennel, he moved into an outdoor mew where he was soon flying laps, demonstrating strength and control on the wing. The mew was outfitted with a variety of perches to test his balance on one leg and he was able to perch comfortably on everything (preferring the highest perch available). Throughout his captivity, Bato demonstrated unusual patience and alertness to his circumstances, resisting much less than most rehabilitating birds. He also bathed and ate well, both good signs for his recovery. 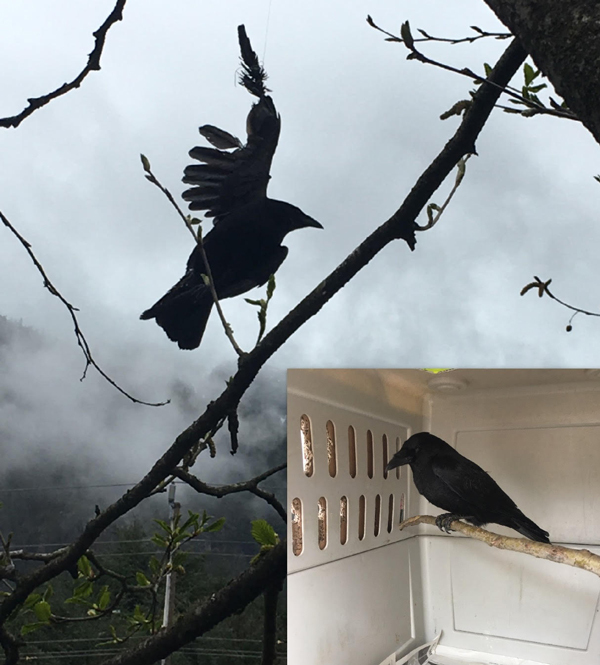 Crows will protect each other from predators, so as his release date approached, his caretaker kept an eye out for crow activity in the Juneau area. 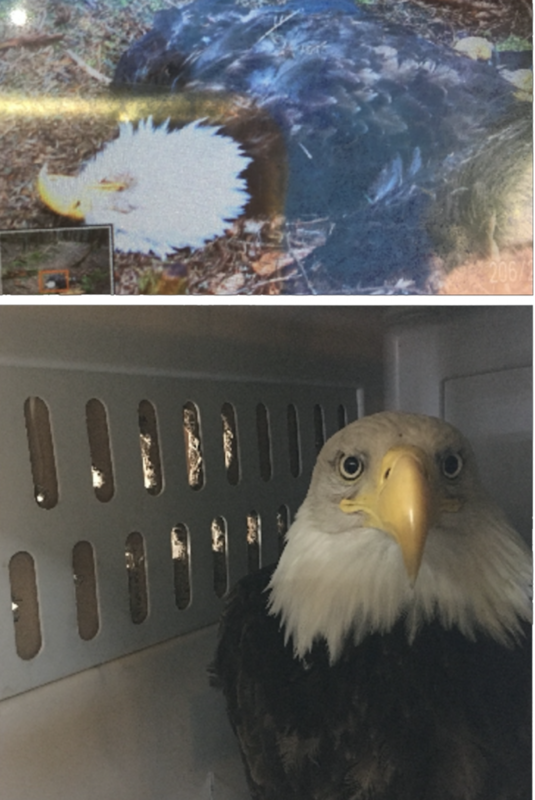 Bald eagles and other predators will target birds that stand out, and Bato would be especially vulnerable immediately after release. During the winter, northwestern crows often band together into large flocks which include many family groups that disperse more widely during the breeding season. They sometimes break into smaller groups to feed during the day, but always group together at night to roost in the same tree. Because they tend to be more concentrated, finding a group of crows can be a challenge in the winter months. On December 13, Bato’s caretaker found a small group of crows feeding in the intertidal zone south of the Juneau-Douglas bridge and Bato was released there in the presence of his caretaker and rescuer. He flew into an alder tree and perched overlooking the water while he regained his bearings. About ten minutes later, a flock of over 65 crows flew up the channel; as they passed, Bato bolted out of his tree and flew after them, disappearing over the bridge in their wake. They likely met up soon thereafter and we hope that Bato reunited with his family (crows mate for life and can form long-term bonds with their offspring). Bato sports a silver U.S. Fish and Wildlife Service band on his good leg, so please keep an eye out for him, and let us know if you see him! On May 28, 2014, an all white bird with pink eyes was delivered to a Juneau Raptor Center volunteer’s home. The person that delivered the bird said there were adult robins close to where this bird was found. The bird was very quiet when first brought to JRC but after it made its first sounds, it was determined to be a juvenile, albino-pigmented robin. Bob Armstrong, a local birder who has written several books, took pictures of this bird and shared the pictures with JRC. He also shared a web site with JRC concerning albinism in birds. 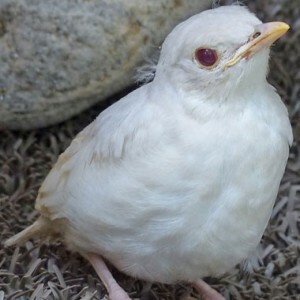 Research shows pure albino birds seem to have weaker feather structure than a partial albino. 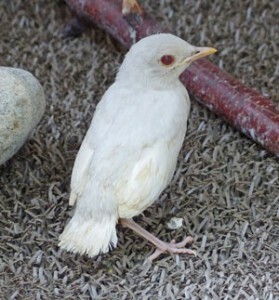 Almost every species of bird has albino or partial albino birds. Hence the feathers are more easily damaged. Also, as with human albinos, albino birds lack pigment in the eyes which makes them sensitive to light. Interestingly around the same time JRC received the albino robin, another member saw a robin at the golf course that had partial albinism with scattered white tail, wing and body feathers but full adult plumage elsewhere. Several years ago, another member reports having seen a robin with a white tail but the rest was natural coloration. On June 3, his caregiver reported that the robin was doing pretty well. The bird was starting to eat on its own and eating a lot of earthworms, small meal worms and wax worms. He also seemed to be grabbing at crickets, eating berries and soaked monkey chow. It was noted that the bird should soon be able to fly but the tail feathers are not full length as yet. Most songbirds become prey or are otherwise compromised long before they die of old age. Because JRC’s mission is to rehabilitate and release wild birds, the decision was made to release this bird as long as it exhibited the ability to feed itself and fly. On June 15, the albino robin was transferred to an outdoor enclosure in order for it to build up strength for flying. The robin managed to squeeze itself through a small open space in the enclosure and self released on June 19. We hope for the best for this very unusual bird. JRC was contacted by the naturalist aboard the cruise ship Carnival Miracle on April 30, 2014. These two birds had encountered bad weather and were found on the deck of the ship on April 30. Upon the ship’s arrival in Juneau on May 1, the birds were transferred to JRC’s care. The birds’ feathers and beaks were cleaned with water. They were also given subq fluids and an antibiotic injection. They were placed together in a large kennel with netting so that their feathers would stay clean. They rested all day. 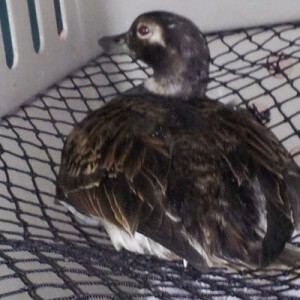 Later in the day they were taken to Lena Cove (“out the road”) for release. The male immediately went into the water and swam away. The female, after looking around for a bit, flew away strongly. Informational: Formerly known as Oldsquaw, the Long-tailed Duck breeds in the Arctic and winters along both coasts of North America. It is distinctive among ducks in plumage, molt sequences, foraging behavior, and vocalizations. 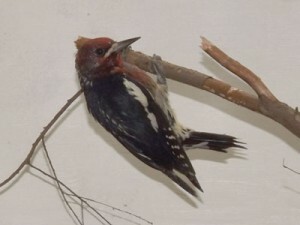 On August 28, 2013, a state worker found a red-breasted sapsucker on the ground next to the Department of Natural Resources building downtown. The bird showed no inclination to move and, after 10 minutes of observation, was picked up by JRC; she was likely the victim of a window strike. A volunteer took Samantha home and placed her in a kennel overnight with wild elderberries, some of which she readily ate. The next morning, her caretaker put her on a regimen of anti-inflammatory/pain relievers (standard procedure for head injuries) and was examined more closely. She had no visible injuries and was able to fly, but did not have full use of her feet, especially the left foot, and so was unable to perch. She moved around the kennel with her wings and feet, drinking from bowls of diluted maple syrup (which mimics the tree sap she would eat in the wild) and eating from a variety of offered foods including berries, crushed nuts, hardboiled egg yolk, peanut butter mixture, meal worms, and suet. On the morning of September 1, Samantha began trying to perch on vertical logs placed in her kennel; at first she was unable to remain upright, but by the afternoon she was perching upright. We hope to release her soon. Update: On September 2, Samantha was transferred to an outdoor mew where she had more room and where her caretaker could better assess her recovery. The mew was outfitted with two tall logs and several shorter logs for her to perch on, since the typical horizontal perches are not desirable for woodpeckers. The logs were smeared in places with peanut butter mixture and suet so she could forage more naturally. She drank from bowls of diluted maple syrup and ate from cups of nuts and other foods. Over the course of a week there, Samantha gradually gained more control over her feet and legs until she was able to move up and down the logs and could even perch on the vertical plywood walls. Her flying also improved until she could fly circles in the mew without landing (which made capture difficult) and she’d started drilling holes in the logs and bathing regularly. On September 9, Samantha was released in Cope Park and immediately flew into a spruce tree. After circling it for a few minutes, she flew into a nearby hemlock tree where she appeared to start actively feeding in the bark. Red-breasted sapsuckers typically migrate in September to overwinter farther down the coast, so we hope she’s on her way there now. 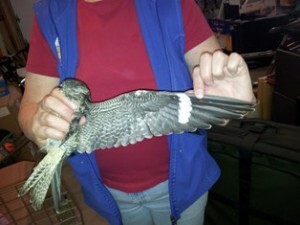 The Juneau Raptor Center recently had an uncommon visitor arrive for treatment. The bird was found alongside Thane Road at the south end of the Juneau road system on August 19, 2013. 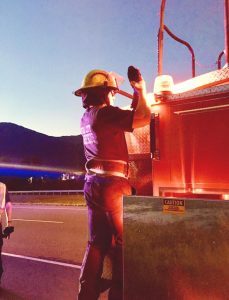 The initial report was that a hawk of some kind had been found “flopping” along the side of the road in the early evening hours. Obviously injured, the Good Samaritans quickly contacted the Center to report the injured bird and a volunteer was soon on scene to recover the hawk and get it into treatment. Upon arrival the bird was already wrapped for transport. Picking up the bird the volunteer was thinking this was a pretty small hawk and maybe it was a small falcon or owl but the identification would have to wait. The volunteer had already put in a call to a second member of the Center advising she would be on the way long before the picking up the bird so all was ready when the bird arrived for treatment. Both volunteers were curious as to what kind of raptor they had in their hands and slowly unwrapped the injured animal. The first comment was “what’s that” followed by “I don’t think we’ve ever had anything that looked like that before.” The bird was small and dark with long, tapered wings and there was a white patch on the upper and lower surface of each wing. The head was very small as was the beak. Again identification had to wait as the initial exam indicated a head trauma that needed attending to. The bird’s left eye was partially closed and the right did not react to light very well. An anti-inflammatory was administered and the bird checked for other injuries but surprisingly the bird was otherwise uninjured and went into a treatment kennel for the night. The next day would let us know how severe the injuries were. 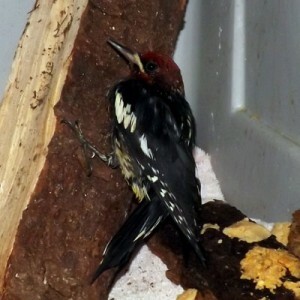 It was now after 11 PM but the question of what kind of bird was in care still lingered. But thanks to Bob Armstrong’s book Guide to the Birds of Alaska the mystery was soon solved. Using the grouping of birds in the book it was easy to eliminate most everything the bird wasn’t. The few sections left quickly revealed we had a hawk, sort of! The next morning the bird was standing, the eyes were bright and alert, it was vocalizing and trying to get out of the kennel. The kennel was covered up and all lights turned off to let the bird rest some more and then determine if a quick release was possible. By late afternoon the bird getting very aggressive in the kennel as soon as the light came on and was hitting the sides of the kennel in an attempt to escape. A quick exam was done and the both eyes were found to be equal and reactive and no other injuries could be detected. A quick trip to the back yard and after sitting for a minute or so the bird lifted into the air, made a couple of circles, probably to get its bearings and then headed for the woods along the Mendenhall River. On August 1, 2013, Juneau hikers found a fledgling marbled murrelet on the ground in the Dredge Lakes area. A JRC volunteer took him in, hoping to release him the very next day. Marbled murrelets nest on the branches of old growth trees or sometimes on the ground near cliffs, often miles from the ocean. When ready to leave the nest, the fledglings must fly all the way to the ocean without landing and without the guidance of their parents. 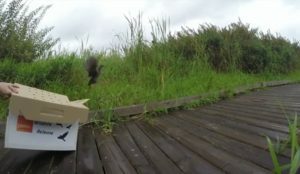 Those fledglings that don’t make it to the ocean on this first flight have little chance of survival, but we hoped that we could drive Stuart the rest of the way to the ocean and release him among other murrelets. The first evening in captivity, Stuart was force fed krill and spent the night on netting suspended in a kennel (netting helps distribute the weight of heavy seabirds and keeps them clean). The next day, his caretaker let him swim to check that his feathers were waterproofed (a requirement for life on the ocean); unfortunately, he quickly became soaked to the skin and so his release was delayed. At that point, it was entirely up to Stuart to get himself ready for the ocean by preening his feathers to the point at which they would shed water (feathers are themselves waterproof, but do not protect the bird unless they are properly cleaned and arranged through the act of preening). Stuart was given the opportunity to bathe in saltwater every day and was spritzed periodically with salt water to encourage him to preen. Unfortunately, he never showed an inclination to swim on his own and only preened rarely, nor did he ever eat on his own. His caretakers force fed him a combination of krill, smelt, silversides, and herring several times a day, but after two weeks of care Stuart passed away despite our best efforts. It’s possible that a congenital disease, parasite, or other underlying issue preventing Stuart from reaching the ocean in the first place and eventually caused his death. On July 3, 2013, three swallow nestlings were found on the sidewalk on Franklin Street in downtown Juneau. One was dead and the other two were very much alive, and very hungry. The surviving birds were put in a box for safekeeping and JRC was called. Given the location and inability to find or access the cavities that the birds were nesting in, the two survivors were adopted by a JRC volunteer. They spent their first afternoon in an office eating soaked dried dog food. The next day, their diet expanded to include mealworms and crickets (the diet of swallows is almost entirely comprised of airborne insects, so the crickets help mimic a natural diet). The nestlings were mostly feathered, though some feathers still had wicking and some areas had yet to grow feathers at all. Nestlings are voracious eaters and Hansel and Gwin chirrup sweetly every half hour or hour to be fed. They wake up around 4:00 a.m. and expect to be fed regularly thereafter until about 8:00 p.m.
On the second day, Gwin grew white feathers over her eyes, which is a diagnostic feature of violet green swallows. Hansel appears to be about a day younger and grew his first white eye feathers the following day. They spent several days in an artificial nest, but began perching on the sixth day and now sit entirely on small branches. We hope to release them into a group of violet green swallows soon. 7/15/2013 update: Gwin and Hansel began flapping vigorously on their perches on July 10 and took their first flights on the 13th; both could immediately fly laps around their room (though landing was more of a problem). 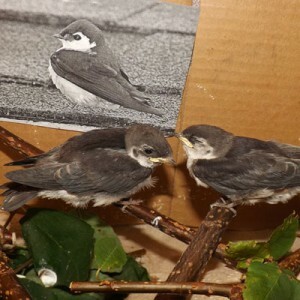 On July 15, their caretaker found a flock of violet-green swallows feeding above 8th St., likely the same flock Gwin and Hansel were born to a few blocks below. 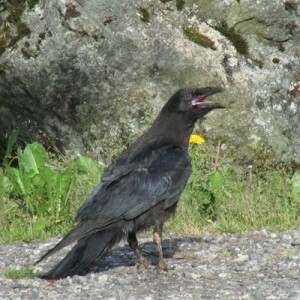 The adults even appeared to be feeding fledglings in the air as they hunted and conditions were perfect for a release. The fledglings were quickly gathered up and taken there. After getting his bearings, Hansel took off and made several large circles in the air before flying into the trees where the flock was resting. He was immediately greeted by an adult who appeared to try to feed him as he flew! Gwin followed shortly thereafter. It was an ideal release—look for Gwin and Hansel and their colony swooping over downtown Juneau! On June 29, 2013, JRC was called about a robin in a nest on the ground by Juneau’s Thane Road. It was thought a parent might be nearby to care for the baby so the caller put the nest/baby under cover. JRC would check on the bird the next morning. JRC went to the site and found the bird laying quietly in the nest. The nest and bird were put in the car, the heat was turned up on high, and Kevin was taken into JRC care. It was obvious he was close to death. Food and hydration was immediately prepared, force-feeding him small amounts of liquid food every10-15 minutes for five hours. He began to gape weakly and was then fed very small amounts of food. The next morning he was much more energetic. Since then Kevin rapidly improved, eagerly eating and flying well. On July 14, he was released into the caregiver’s back yard to explore. He came back inside at night and as of July 23 he’s now back in the wild! On June 18, 2013, a local resident reported a raven hanging by its wing in a tree. JRC responded with long-handled dip net and got the bird down. 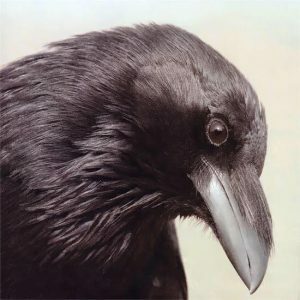 Exam revealed a young raven, pink mouthed and bluish eyes. 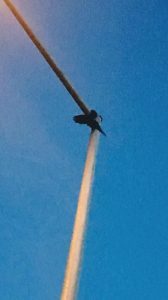 The tips of one wing were tangled in kite string and it was about 20 feet up. After removing the kite string, it was determined that the bird couldn’t fly and had a knot at its shoulder. Bird given Arnica (a homeopathic antibiotic) and ate everything put in the kennel. On Saturday evening, June 22, the bird was examined again. The exam showed both wings were symmetrical (extend equally) so the bird could flap its wings well. The bird was taken to where it was rescued and released on Sunday morning June 23. It hopped up on a rock and called for its parents, who responded. It then flew up into the trees. He’s back home! 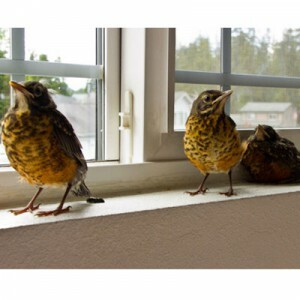 On June 3, 2013, Juneau, three baby robins were rescued from their nest, which was built on a strut of a roof in a precarious place. The nest came loose; the babies fell out and hopped around on the ground. 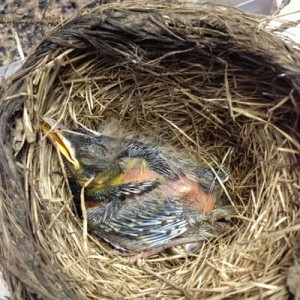 They were put back by the occupants of the building only to fall out again when the nest fell a second time. The Juneau Raptor Center decided it was best to take the babies because the nest was not stable. The robins’ parents were not happy when the babies were removed. Treatment began immediately after the babies came into our care. They were fed continuously throughout the day; they were gaping and crying for food. Every time they were fed they were allowed to fly out of their enclosure. At first, they only flew to the top of their enclosure, but as each day passed they flew further away and up to higher heights. They were gradually transitioned to eating on their own. When they were able to fly to the highest heights available to them and they were eating the majority of the food on their own, they were released in the caretaker’s back yard on June 14. They immediately began pecking at the ground trying to find food. The caretaker continued to leave food out for them as they explored further and further from the backyard. Eventually, they stopped coming back for food. Juneau was sunny during this time period the birds were in rehab. The rehabber had a special moment with the birds after their last feeding of the day as the sun was going down. They had been fed, it was very quiet and they were all three perched on the top of their enclosure, content and gazing out the window. The rehabber just stood there and took a moment to just be — just like the baby birds. The American Robin is the largest thrush and could be America’s favorite songbird. 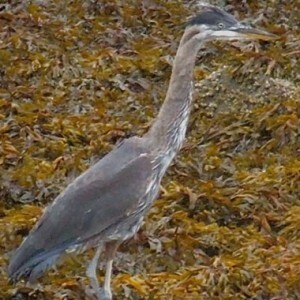 You can see this bird in Juneau, often times hopping along in yards, finding worms. The robin is found in more areas of North America than most other birds. The robin eats a variety of food, such as soft invertebrates and switching to fruit during the fall and winter months. The female robin lays one egg a day for 3-4 days. The eggs are incubated for 13 days. Hatching takes 24 hours and the babies spend 13 days in the nest before they fledge. Robins can have up to three broods in one season but typically have 2 broods. Some robins stay in Juneau year round, but most migrate. On May 25, 2013, two JRC volunteers responded to a call about a bird down by Juneau’s False Outer Point. The caller said she would stay at the site until JRC responded. 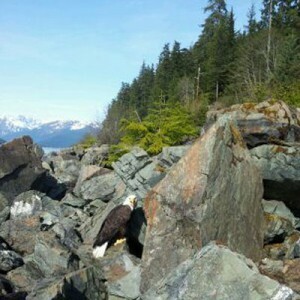 The volunteers drove to the site and found an adult bald eagle flopping around on the rocks. One volunteer went down the hill and tried to herd the bird up to the top so he could be captured. However, the eagle managed to get himself wedged in a crevasse. The second volunteer went down to pull him out. While doing this, she found that the bird had fishing line wrapped around his left foot and left wing. A pocketknife was used to cut the fishing line that had a double salmon hook embedded in the feathers of the abdomen; luckily the bird’s skin was not punctured. Once the fishing line and hook were removed, it was determined that the bird could be released the same day. After release, JRC volunteers watched the bird for about 20 minutes, encouraged him to fly away, which he did. 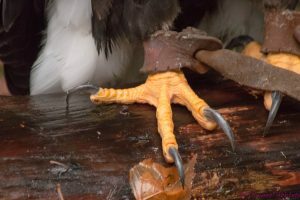 There had been a rash of Juneau eagles coming to the Juneau Raptor Center with the same general symptoms. 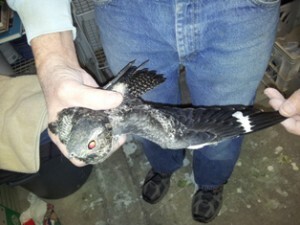 The birds have been easy to recover as they act like they have been drugged. They are lethargic and do not attempt to avoid capture in most cases. The two most recent cases to come to the Center were found on the same date and in close proximity to each other. These two juvenile eagles were, as the others before them, quite docile and easily captured. The birds were taken to volunteers’ houses for treatment. Both birds began to recovery a few hours later and became very aggressive. The one difference with these two birds was they both cast, or “threw up,” pellets that contained the remains of mice or other small mammal bones and fur. Since the birds were found in the same general location there is a possibility that something in the animals consumed by the birds was related to the bird’s condition. In years past several birds have been treated at the Center for ingestion of some toxic agent that depressed the bird’s system to the point they could not fly or even defend themselves. A notable case occurred several years ago when three juvenile birds from an outlying community were inadvertently poisoned when they fed on the remains of a dog that had been euthanized. The drug used to euthanize the dog depressed the eagles’ breathing and heart rate to almost undetectable levels. One bird was determined to be dead by a volunteer and was being put in the freezer when the volunteer felt the bird’s chest rise and fall as it took a breath. Luck was with this one and the other two birds as they were stabilized at JRC and shipped to the Alaska Raptor Rehabilitation Center in Sitka for extended care and eventually released. May 5, 2013: Both of the recent birds recovered and in a very short time were eating well,acting like normal eagles and ready for release. Because of the quick turnaround needed for the release there was not time to notify the public about the releases.